Ankle sprains occur by twisting your ankle to one side, and as a result, the corresponding ligament or ligaments become stretched or torn. The most common ankle sprains occur to the anterior talo-fibular ligament and the calcaneo-fibular ligament on the outer side of your ankle. This is referred to as an inversion ankle injury. Sprains affecting the inner side of your ankle are much less common. 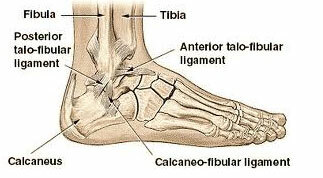 These effect the deltoid ligament and are referred to as an eversion ankle injury. If you have an ankle sprain your ankle will generally be painful, you will see swelling, and often time the swelling might be quite severe. Often times your ankle may appear to show black and blue discoloration. Office evaluation for this problem generally consist of xray examination to rule out fracture of the foot and ankle. Treament for and acute sprain will vary dependent of the severity- ranging from ankle splinting, bracing to casting or even surgery . Some ankle sprains are associated with other conditions. Fractures of the fifth metatarsal bone, anterior process fractures of the calcaneus, nerve injuries, and chronic lateral ankle instability are some examples. These problems require professional evaluation by a Board Certified Foot and Ankle Surgeon such as Michael J Marcus DPM FACFAS.